This Thanksgiving, as for several years past, we will not be traveling. We will miss the blessing of giving thanks with our parents, grandparents, uncles, aunts and cousins. But the two sides of the family lie in opposite directions. Neither Atlanta nor Rochester, New York is an easy destination during this holiday season. The only easy destination, of course, is one in the immediate neighborhood, and we are fortunate to be heading there. We are grateful to our good friends who, once again, have invited us to their Thanksgiving table with their extended family. Our daughters have been in school together since Kindergarten, and we’ve grown close over the years. We know the day will be easy and pleasant. 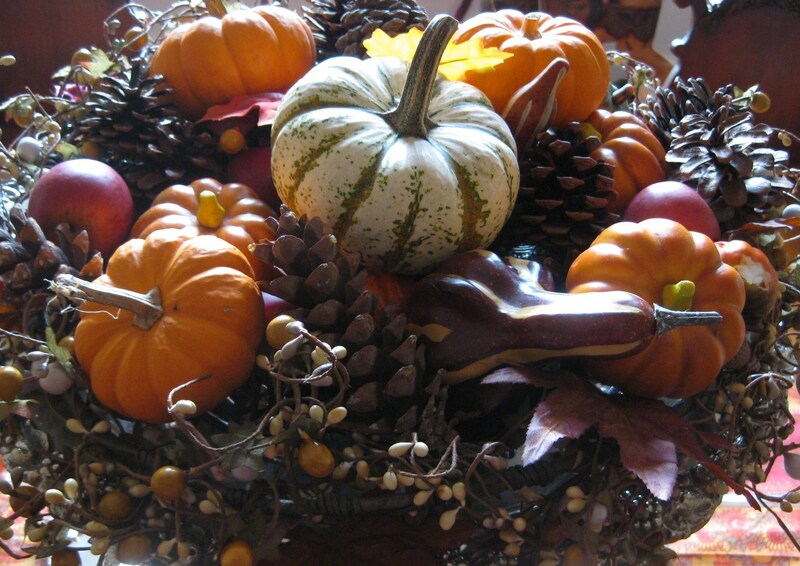 Thanksgiving with our gracious neighbors reminds us that friends are family, too. As an adult, I’ve probably spent more Thanksgivings with friends than with family, due to the difficulties and expense of travel. During graduate school, I never flew home for Thanksgiving, but I was lucky to have friends who included me in their celebrations. I’ve spent the holiday in various spots along the East Coast, from South Jersey to Boston. One year I fell into a great house-sitting gig in a lovely Princeton neighborhood, and I was able to extend Thanksgiving hospitality to a group of international friends. Together we represented Denmark, the Netherlands, Britain, Sri Lanka, Cyprus, and the U.S. (Sweden, also, if I count my husband. We had recently begun dating, and he’s half Swedish. ) I cooked my first turkey and prepared our other family standards. It was a festive, happy day, and it felt good to be the host, instead of the guest, for a change. Another Thanksgiving during our student days was less pleasant, although the details are vague. For some reason, it was just H and me, and we were preoccupied and dispirited with our research. H was spending long days in his lab at the E-Quad, and I think I was in limbo, awaiting much-delayed advisors’ comments on my dissertation. Seems like I cooked in an unfamiliar kitchen. As students we each lived in a dizzying variety of low-cost rentals, and we were frequent house-sitters. The temporary homes blur together indistinctly now. I thought about my episode of Thanksgiving pettiness a few days ago during the youth Sunday school class I lead. We had been discussing the story of Jesus healing a group of lepers (Luke 17:11 – 19). Of the ten that are restored to health, only one returns to offer thanks. Apparently the others are so immediately caught up in their earlier lives that they miss the magnitude of the transforming event. No longer slaves to a disfiguring disease that made them grotesque social outcasts, yet they forget to thank their healer. I was like one of those ungrateful, unthinking former lepers that day, lost in the distractions of everyday life. I forgot about the blessings that surrounded me: the presence of H, a kind and loving person who had linked his life to mine, the luxury of higher education, a comfortable place to live, a delightful environment, and most of all, God’s unwavering love. I let the absence of mashed potatoes poison the day. Therefore, on this Thanksgiving, I will give thanks for life’s tremendous blessings, for friends and family. I won’t let a lack of mashed potatoes* blind me to God’s grace. *I can proclaim this with confidence, because our friends agree that mashed potatoes, not boiled, are the Thanksgiving standard! Now that the question of dog or no dog had been settled in the affirmative, my husband asked for only one consideration: a dog without excessive fluff. At first this saddened and irritated me, because I love the fluff. While there are many short-haired, sleekly handsome dogs, my personal tactile preference is for thick, luxurious fur into which I can sink my face and fingers. I had envisioned a cuddly mixed breed puppy, perhaps with Chow Chow, American Eskimo Dog or Keeshond parentage. Or maybe we could find a black and white Popi look-a-like. (His full name had been Potpourri, to reflect his mixed heritage of Chow and Cocker Spaniel.) But when it hit me that I would be an adult instead of the child in this dog-human relationship, I began to see the housekeeping advantage of less fluff. I would be the primary wielder of vacuum, Swiffer and dust-cloth. Still, I needed a dog with substantial fur. Early on in our dog-decision process, I assumed we’d simply look for an appealing mutt at the Humane Society, likely the best place to discover a potential Popi II. But as I considered my childhood dog’s personality in a less nostalgia-tinged light, I began to second guess both the shelter and the Popi aspects of the plan. My beloved dog’s loyal devotion to my parents and me was a big plus. We were all the pack he needed. He had little interest in other humans or in his fellow dogs. He didn’t require doggie play-dates (an unheard-of concept then). We saw him as highly intelligent, discerning, unwilling to waste affection on strangers. These positive points had their corresponding negatives. Popi didn’t suffer fools; he didn’t take crap from anyone. On a number of occasions, when provoked, he bit people, usually children. He wasn’t vicious; he never bit without due cause, and he rarely broke the skin. During those less litigious times, such behavior was more frequently seen as justified. Parents now tend to think a dog has no business biting their child, even if the kid does sneak up and roughly wrap a belt around the dog’s neck or try to stuff the dog into a box. I realized that while I still appreciated Popi’s aloofness, I didn’t want to deal with a biting dog, no matter how justified. Another problem with choosing a shelter dog is our family’s soft-heartedness for animals. What if we saw a dog that tugged at our heart strings but somehow wasn’t suitable? I was afraid we’d be haunted by the memory. I still remember a dog that looked plaintively at me twenty years ago when I happened to walk past it at an adoption event at a shopping center. I was a student; I had no permanent address; I couldn’t get a dog. But I can’t forget that face begging for love. D and H are similarly inclined. Gradually, I realized we should consider a purebred dog. I had been a lifelong champion of mutts, so this took some getting used to. With a purebred we could avoid the problems of uncertain temperament that can result from a mixed breed’s unknown parentage. The best path, we concluded, was to decide on a breed that fit our needs, then locate a reputable breeder. We would be more likely to get a non-aggressive dog. We would have a higher chance of getting a puppy. And we could better avoid the heartache of having to refuse a dog that wasn’t a good fit. The more I learned about the breed, the better it sounded. The Shiba tends to be reserved around other dogs, but not aggressive toward people. Maybe we could get a touch of Popi’s aloofness but none of his bitey-ness. D and I were excited; we could sense our dog dream becoming a reality. Me with my little puppy Popi, around 8 weeks old. It was time to see my daughter with her own puppy! After seeing Kiko again with Beau, his playmate from puppy days, I’ve been thinking about the protracted process through which we became a family with a dog. Popi, my childhood dog, was with me from second grade until after I finished college. I have felt his absence ever since. But our family doesn’t acquire dogs lightly. The time was not right, and so the years passed by, dogless. My daughter began campaigning for a dog nearly as soon as she could talk. She was, no doubt, at least partially motivated by the Popi stories I had been telling her since she was born: how he once boarded the bus to Grant Park, as though seeking out his roots, his utter lack of fear, his unshakable self-confidence, his delight in the little stocking Santa filled for him each Christmas, his talents for hide-and-seek and squirrel scattering, his noble loyalty to family. Popi had become a legend, for me and my daughter. But the time still wasn’t right. My husband was traveling four days a week, and I could all too easily envision the complications of being an often-single parent raising a young child and a puppy. (I know my limits, and they are low.) 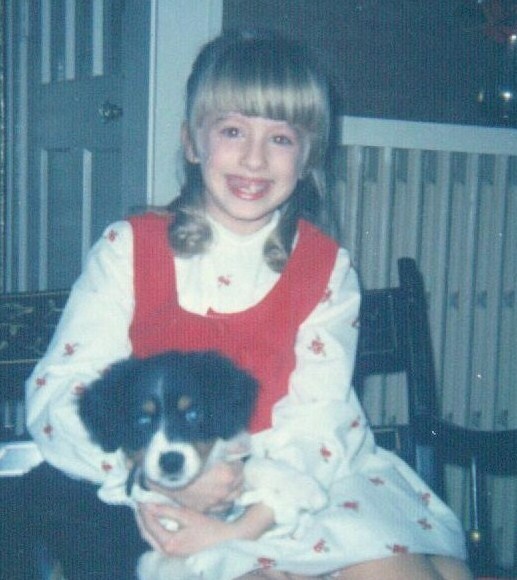 Thinking back on my experience, I told D that I would be ready for a dog when she reached second grade. H had one final defense to which he clung fixedly: he was convinced that his allergy to cats extended to dogs. And he was pretty sure that his daughter, so like him in many ways, would prove to be allergic, also. I had D allergy-tested. She had no animal allergies (not even to cats). At long last, H reluctantly agreed to testing. Unfortunately for him, he showed no allergy to dogs. Had he been a less honorable man, he would have tried to rig the test. He was out of ammunition, he had lost the battle. D and I were jubilant: we would be getting a dog. 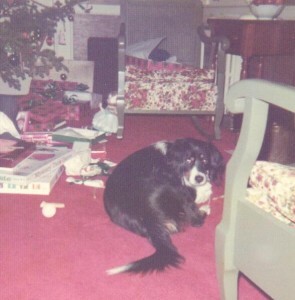 Popi on a Christmas morning in the early 1970s, with his stocking. My gifts in the background include the Game of Life, Mystery Date, and a Madame Alexander Alice-in-Wonderland doll. 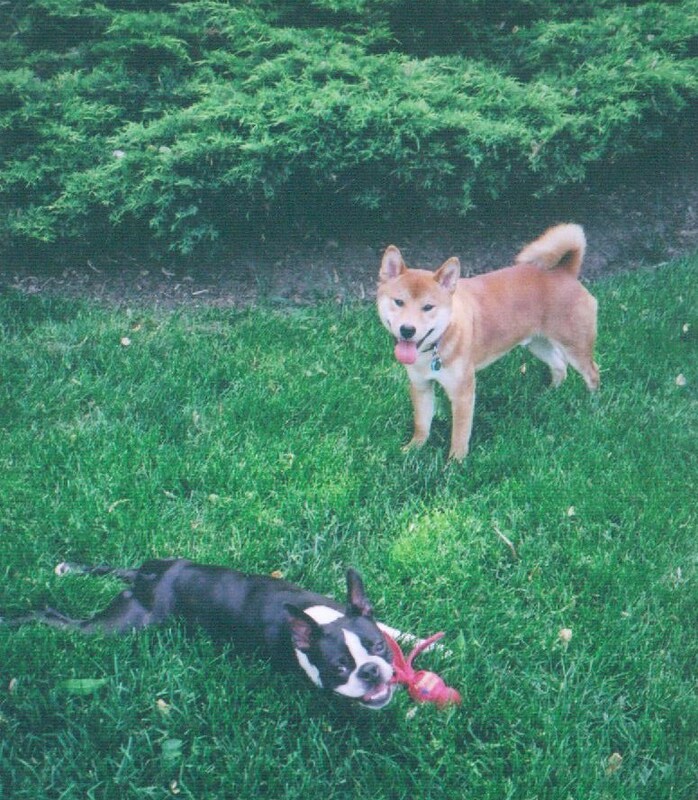 Kiko and Beau in their younger days: a moment of rest during playtime. Kiko had a reunion this week with an old pal, Beau the Boston Terrier. Their friendship was sealed the day they met in the neighborhood, nearly four years ago, when Kiko peed on Beau’s head. 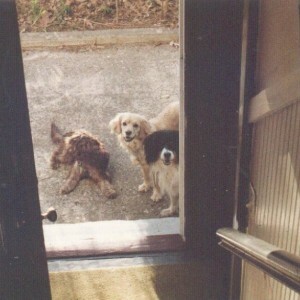 During their puppyhood they were best buddies, frequent companions for walks and exuberant doggie play-dates. The question “Kiko, Want to go see Beau?” was answered by an especially enthusiastic tilt of the head. Celeste, Beau’s owner, is a lovely, easy-going woman (she laughed when Beau was sprayed by Kiko), and I liked her instantly. Twice a week, for an hour or so, she and I would talk and watch our dogs tear around her spacious, fenced back yard. We had no fence at our house then, and running free was a great luxury for Kiko. Beau is highly proficient at Frisbee-catching and tennis ball retrieval. Kiko does not excel at these pursuits; he cannot grasp the concept of running away from the object as it’s thrown. But he is fast. He used to be lightning-fast. He could turn on a dime, reverse directions in a flash, and leap like a deer. He very nearly flew, and it was exhilarating to watch him. Our dogs’ lively play-dates were cut short when Beau required knee surgery. Several months later, his leg had healed, but before we could meet again, Kiko was injured, in our own newly refurbished yard. When we moved in, the area behind our house was not a yard but an expanse of cracked concrete that might surround an aging gas station; there was considerable room for improvement. By this time we were almost finished with the renovation. We had our wrought-iron fence, a grassy area, stone patio and a new porch that still lacked screens and railings. Kiko and I had returned from a walk with two friends and their dogs, and I invited them in for a short off-leash run. This was the very first time Kiko had played with guests in our new yard. He appeared thrilled at the opportunity to impress his large lady friends, a Lab and a Doberman. He sped around crazily, a blur of red fur. When he could run no further, he paused, panting mightily, to survey his domain from the porch. Then, going for the big finish, he leaped off into the grass. He must have landed wrong. Kiko is tough, and he didn’t whine or cry. But he was hurt. He sat down at once, holding up his hind leg gingerly. He flattened his ears against his head, looking up at me imploringly and pitifully. At this point, my mind launched into the absurd, frustrating routine I think of as the “If Only” game. I try to rewind recent unfortunate events. If only I could move time backwards and not let the dogs play. If only I could keep Kiko from taking that jump. If only, etc., etc., until I feel like screaming. Had Kiko simply broken his leg it might have been easier. Instead, the injury was ambiguous, perhaps a micro-tear in the Achilles tendon, perhaps something else. A complicated surgery was a possibility, but because the outcome was uncertain we didn’t seriously consider it. For six weeks he wore a bright green splint. Tight and itchy, of course he hated it. The splint was to be kept dry. We were given an I.V. bag to tie around the splint during rainy-day walks. This was not a good solution. He had only to kick his leg a bit to send the bag flying. Duct tape and plastic wrap were no more effective. Sometimes I didn’t notice the missing bag for a while, until I turned to see it lying in a distant puddle. When this happened, all I could do was carry my dog home. On many occasions I could be seen trudging through the wet leaves, Kiko in my arms, the rain pouring down my face. I felt like an actor in a made-for-TV post-Apocalypse drama. It’s been two years now since Kiko’s fateful jump. On most days he seems fine, but he has lost some of his amazing speed. And he will probably always run a little strangely. His back legs tend to move simultaneously. We don’t encourage him to run for long periods, but since he’s older, he tires more quickly anyway. There is always the chance that he could re-injure his leg. This week marked the first time Kiko and Beau have played in our yard. Kiko looked elated to see his buddy, and he showed him that he can still move. They ran together with something close to their former energy and speed, but only for a short while. Celeste and I leashed them and went for a walk. By then they were subdued. As a puppy, the excitement of being out with Beau often incited Kiko to bursts of frenzied circuitous sprinting. If Celeste and I weren’t vigilant, we’d be tangled up in a pretzel-like configuration of leashes, dogs, mailboxes, shrubbery and bystanders. This time there was no such juvenile behavior. Our dogs are young adults. How quickly they grow up! 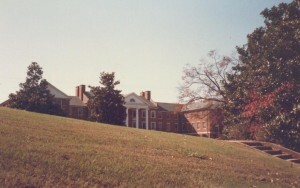 Rutherford Hall in the fall, during the 1980s. My trip to Atlanta was occasioned by a reunion of old college friends from the University of Georgia. We met as freshmen living in the basement corridor of a wonderful old dorm, Rutherford Hall. We were saddened by the recent news of the decision, despite much protest (including ours), to demolish Rutherford and build a larger, more luxurious new residence hall in its place. Out of six former Rutherford girls, only three could rearrange our lives to attend. But three good friends together again after so many years is nothing to sneeze at. Sarah (all names have been changed) had recently moved back to Atlanta, after years in England with her family. Always the gracious hostess, she volunteered her comfortable home as our headquarters. The last time I saw Sarah I was moving to New Jersey. 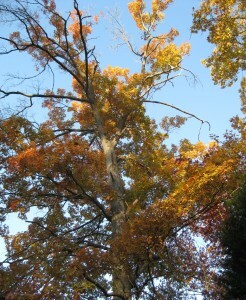 Then recently married, she offered her guest room in Delaware as a stopping point on the drive up. Her hospitality and sense of classic style remain flawless. She retains the ladylike reserve that made her seem wise beyond her years at eighteen, but it’s a reserve that she lets slip a bit when she’s in the company of old friends. Jackie was flying in from Montana, where she has lived now for two decades. I’ve known her since middle school when were both on the school newspaper staff. She was renowned for her articles on European travel. My first memory of Jackie is a newspaper photo showing her seated in a Venetian gondola. I was impressed, and somewhat envious. Our typical family vacation involved visiting relatives in rural Kentucky. Knowing her background, I expected her to be conceited and snooty, but she was nothing of the sort. She was, and still is, a person of kindness and integrity, as well as a magnet for fun and adventure. Jackie was among my closest companions when our 8th grade French class, amazingly, took a spring break trip to France and England. (This was unheard of in the Atlanta Public Schools in the 1970s, but we were blessed with a remarkably spunky French teacher who was determined to turn us into citizens of the world. She found a study trip that was extremely bare bones and thus affordable.) On my very first airplane flight, I sat next to Jackie the seasoned traveler as we flew to New York and then on to Paris. I felt incredibly lucky. By day we saw the famous landmarks I had pored over in library books and old copies of National Geographic. By night, we sat up late giggling with our friends in French lycees and London dorm rooms. Jackie and I roomed together during our freshman year in college. I remember vividly my surprised happiness the day she called to ask me. I had planned to accept a luck-of-the-draw, university-assigned roommate, and I probably would have landed in a soulless freshman high-rise. Jackie’s older sister had lived in Rutherford, and she recommended it for its large rooms, atmospheric appeal and central location. Had I not roomed with Jackie, my first year of college would have been far less memorable. She drove a flashy Firebird, which wasn’t really her style, but it was the car her dad bought her, and she piloted it with flair. (No one else in our group had any kind of car.) She also had an affable older brother in a fraternity. The night before classes began, Jackie took our Rutherford group over to the Kappa Sigma house. My social life was set for the next couple of years. As time has passed, as we’ve reveled in life’s ups and weathered some significant downs, our friendship has grown stronger. Jackie, Sarah and I had much to reminisce about. We were first drawn together by a shared housing woe. Water seeping into the foundation had flooded the room next to Jackie’s and mine. It was pouring across the hall toward Sarah’s room and trickling up to ours when we got to work with towels and buckets to keep the water at bay. The girls living in the flooded room had to vacate, which was too bad, but it left us with a convenient guest area for visiting friends. We weren’t bothered by damp and mold so much in those days, and we didn’t expect a hotel lifestyle. That spring, after another flood, we brought in masses of bamboo from a recent luau and our little hall became as atmospheric as a cloud forest. Instead of being irked by the inconveniences of living in an older dorm, we saw them as creative opportunities and part of Rutherford’s ramshackle charm. During our first quarter, Jackie enjoyed an especially active social life. She rarely cracked a book, but on the weekend before finals, she decided to start studying. While she crammed in the library, the rest of us camped out in our room and zealously created some comically spectacular cut-and-paste art in her family photo album. We used pictures and captions from my National Lampoons and a magazine coyly titled For Women Only that one of us had received as a joke gift. (We were respectful in our mischief; we did nothing that couldn’t easily be undone.) It took a while before Jackie discovered our many-leaved masterpiece, and the anticipation of that revelation made it even better. When she finally removed the album from its shelf to show a friend, several of us were there to witness the hilarity of her shock. As we had expected, Jackie appreciated the humor and recognized the prank as the twisted compliment it was intended to be. Our best times that year arose from similarly mundane circumstances. We kept our doors open nearly all the time, to encourage frequent socializing and pronounced time wasting. We had great fun paging through the Freshman Register (a Facebook predecessor) and making silly phone calls to cute boys. If, by chance, we received a prank call, we were prepared. We’d pass the phone around to everyone in the hall, each of us adding some outlandish comment, to puzzle and embarrass the unsuspecting caller. 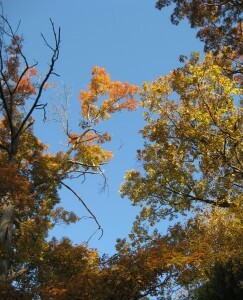 Glorious fall days like today remind me of freewheeling Sunday afternoon drives in the Athens countryside. With Jackie behind the wheel, we’d discover local eccentricity and explore the occasional abandoned farmhouse or unexpected University-owned structure. Our little Rutherford reunion brought with it the realization of how precious and fleeting is the sense of community that flourishes so vigorously during the college years. It’s made more profound because we’re away from home for the first time. That closeness cannot quite be duplicated in the so-called real world of work, parenting and routine daily responsibility. This, I believe, is one of the saddest aspects of growing up. Fortunately we can capture it again in a diluted form, when we reunite to reflect on the good old days. 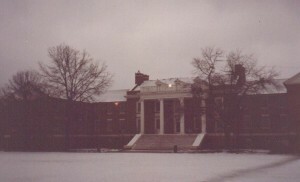 Rutherford in a rare snow, the Myers Quad facade, in the 1980s. How good it is to walk in the morning sun again! Last week when we were still plodding along blindly in the dark, Kiko paused and I didn’t notice (couldn’t see him, never think I really need a flashlight). My shin hit his rock-hard head. The blow didn’t phase him, but I found it painful enough to wonder momentarily if I had fractured my leg. Now that we’ve Fallen Back and said goodbye to Daylight Savings Time, it’s great to see where I’m going again. 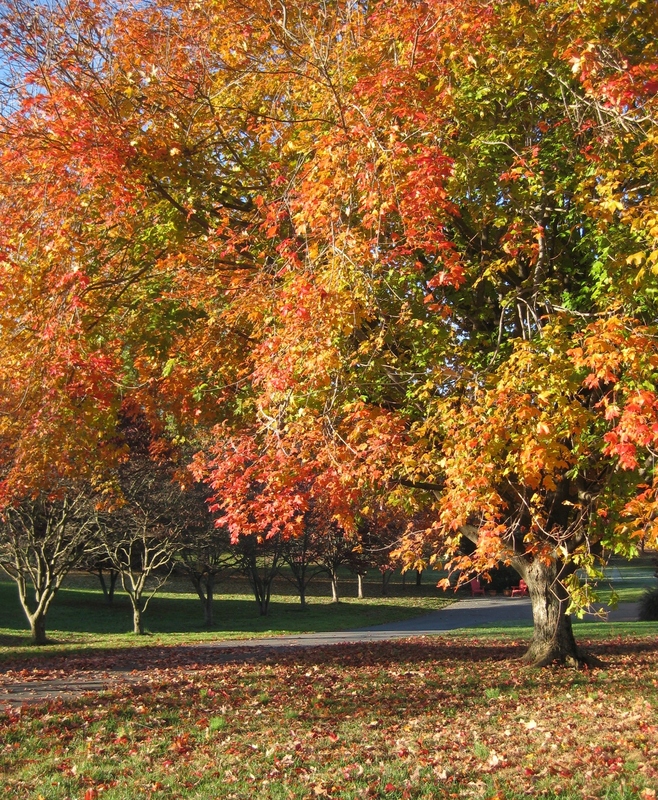 The fall colors are especially brilliant here in Virginia, and we savor them all the more after the devastating rains of this past September. 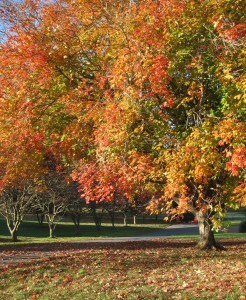 A bright November morning in Virginia. The worst part of the drive from the airport is now over, and Daddy is beginning to slow down. We’re in my old neighborhood, and I’m trying to soak it all in, trying not to miss any detail. 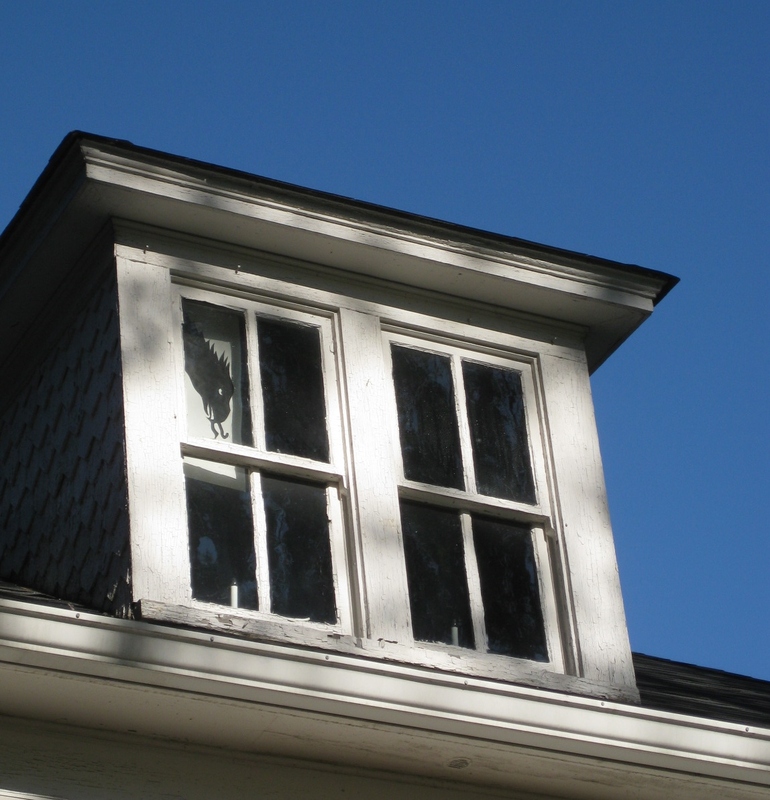 Some houses remain unchanged for the last two decades, still in need of loving care. Others are in the course of being popped up to three times their size. Some invite repeated renovation; each year sees a new style, wing, or entry. Others have disappeared completely, and I try to remember what used to be on each bare muddy lot marked only by a Porta-Potty. Ever since General Sherman burned Atlanta in his March to the Sea, the city’s state of flux has been fast-paced. My parent’s house, though, looks very nearly the same as it did when I was last here this summer. It remains essentially unchanged since 1929, when it was built, in a leafy in-town neighborhood of small brick Tudors and Norman cottages. 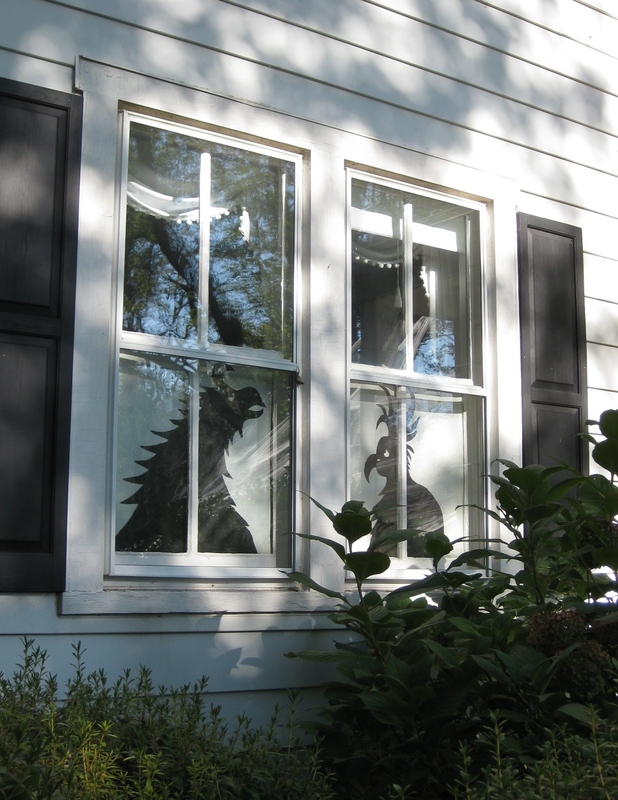 We moved there in the late 1960s, after two years in a suburban rental. Our new house was a mess, but it immediately felt like home. My parents spent years uncovering its classic features–hardwood floors hidden under gold-flecked linoleum and lavender sculpted carpets, plaster walls concealed by wood-grained wallpaper. We gradually updated the kitchen, which still contained its original appliances, chrome-edged, simulated stone Formica countertops and metal cabinets. But we made no structural changes or additions. My mother’s interest in redecoration has not dimmed, but the alterations are smaller in scope now. My childhood room is just as it was when I moved away: the same wallpaper, the antique cherry furniture inherited from my father’s aunt. I know every quirky feature of the house by heart: the sharply curving narrow driveway littered in the fall with acorns, the sound of the brass knocker rattling as the heavy front door closes, every creak along the center hall, the loud click of the light switch in the stair hall, the bathroom faucet handles that rotate the wrong way, the back hall steps lined with walking shoes and cartons of Coca-Cola, the old ping-pong table in the basement used for storage and craft projects, the view of the back yard from my old bedroom window, and the unique, inimitable smell of home. It’s somewhat unsettling to be here without my daughter. I keep thinking she’s upstairs in the playroom, which has become a sort of toy museum. She’s probably unpacking the boxes of baby dolls, stuffed animals and Barbies that my mother lovingly maintains. Or maybe she’s setting up a tea party at the little pink table in the alcove, or rearranging the furniture in the doll house. But the table, the doll house and my girl are all at our home in Virginia. And if my daughter were here, the toys wouldn’t capture her attention nearly as much as my old Seventeen magazines and the wardrobe bags full of vintage clothes in the attic. (My mother has a great gift for design and sewing, and for many years she was possessed of a phenomenal energy that led her to make more clothes than we could ever wear). It’s disorienting, as well, that there is no dog here. If I happen to see a shadow out of the corner of my eye, I think it’s the dog. And each time we leave, I look around instinctively to hug him goodbye. But I’m not sure which dog I expect. Is it my childhood dog, who has now been dead nearly twice as long as he lived? I often think I hear him, my sweet Popi, my stand-in for a sibling. He was a black and white cocker spaniel and chow mix, as aloof to other dogs and non-family members as Kiko is friendly. He often nudged open a partially closed door with his nose, a sound I hear repeatedly in my mind. Popi was so comforting when I was upset—he’d put his muzzle on my knee and look into my eyes with such compassion. Or is it my funny Kiko that I think I hear or see? But Kiko has never set one neat little paw in this house. Returning to a childhood home is a bittersweet pleasure. The things of the past get confusingly jumbled up with those of the present. Old memories collide strangely with current reality. My brain is stretched in uncomfortable ways, and I feel young and old, happy and sad, at the same time. I guess it’s a good thing I don’t often go back alone to my old home. 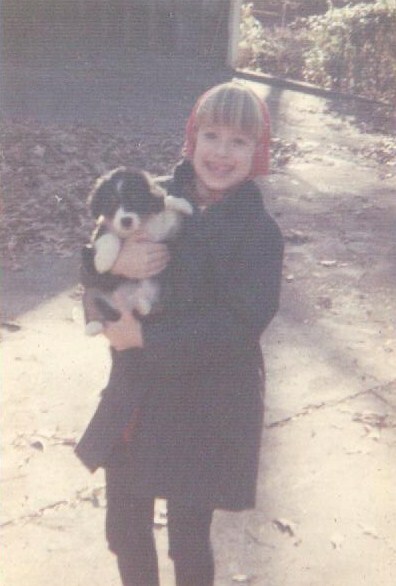 Popi, as a puppy, and me. It was his first Christmas, and our first in the new house. Of course Mama made my dress and vest, and my daughter wore them, as well. Popi with next-door dogs Felix and Cocoa, outside our back door. He didn’t like them, but he tolerated them occasionally. 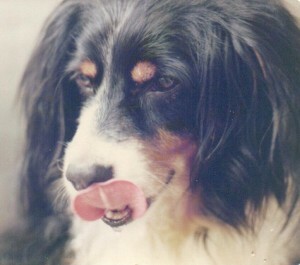 Popi, not long before he died, at age 15. Now that another Halloween has come and gone, I find myself reflecting on the evening, considering some ideas that may improve next year’s experience. This Halloween we welcomed fewer trick-or-treaters than in previous years. The weather was chilly, but a cold, clear night seems to pep up the kids, not keep them home. The main reason for the deficit, I believe, was that Halloween was on a Monday night. A Monday night! For children, it was a day of school and homework, with another early morning to follow. For working parents, it meant rushing home in traffic to handle costumes and try to deal with dinner. 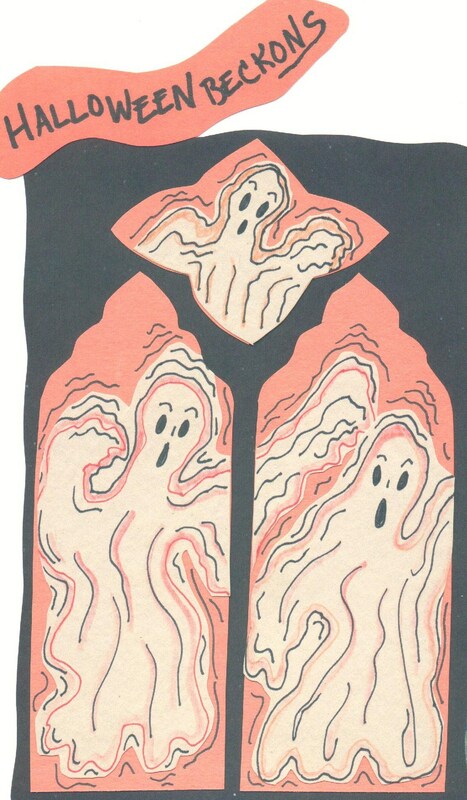 There is no way around it—Mondays (and all weeknights) are awkward nights for Halloweening. There is a solution. Halloween should be celebrated on the final Saturday of October. If we can move Presidents’ birthdays, why can’t we move Halloween? Congress has the perfect opportunity to make things right with the American people for the distress they caused during the debt-ceiling debacle: they can pass a Halloween-observance law. I am almost serious when I suggest writing our representatives. This is the chance for legislators to do something worthwhile, something that would benefit Americans in all income brackets. 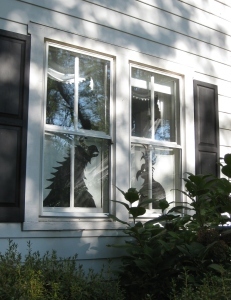 This is the first step towards improving Halloween. 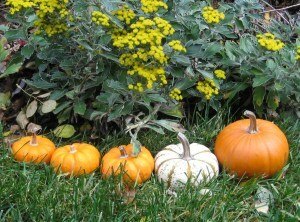 The next step is to encourage trick-or-treating among teenagers. I know it’s become acceptable to gripe about “all these big kids” expecting Halloween handouts. But why should we mind so much? Isn’t it good for the collective health of a neighborhood and our country that teenagers are out with the younger children accumulating treats? On this one night each year, shouldn’t we reward their continued interest in the childhood pleasure of candy? Would we rather they be elsewhere attempting to buy alcohol, cigarettes and drugs? These older kids, of course, should abide by the same rules we try to instill in the younger ones: wear a costume, say “Trick-or-Treat,” be polite and show gratitude. I agree that a logo T-shirt is not a costume, and a sullen silence at my door will not earn candy. We found the teen trick-or-treating presence negligible this year. Our daughter and her six middle school-age friends were among the very eldest of our trick-or-treaters. The only more senior group consisted of three courteous ninth-grade boys who came to the door toward the end of the evening, almost as an afterthought, as though they wanted to see if they could still get candy. We were more than happy to give them chocolate. My daughter will soon be a teenager, and I hate to think her trick-or-treating days are severely numbered. This is only the second year that we have allowed her to go out unaccompanied by an adult on this night. She and her friends are just starting to hit their Halloween stride; it would be a shame for them to have to stop. It seems to be the tallest children who provoke the most negative feedback when trick-or-treating. Short kids may observe Halloween without community comment until they go off to college, but those blessed with height better stay home once they reach sixth grade. Isn’t this height-based discrimination alarming? My daughter is on track to be taller than me by next year, so I am understandably worried. If anyone is really working the system, it’s not the teenagers, but the adults who tote around their babies costumed adorably as peapods, caterpillars, fat pumpkins and such. Parents who would never think of allowing their six-month old to put one pearly tooth near a Snickers bar are out on Halloween encouraging tiny fingers to pick out something good and big from the candy bowl. But that’s accepted behavior, and my husband and I capitalized on it, like everyone else, during the first few years of our daughter’s life. An essential part of the Halloween social contract is pretending that the candy is intended for those babes in arms. Because babies are small, cute and very short (again, it’s a height issue), they therefore deserve mass quantities of sugary treats. 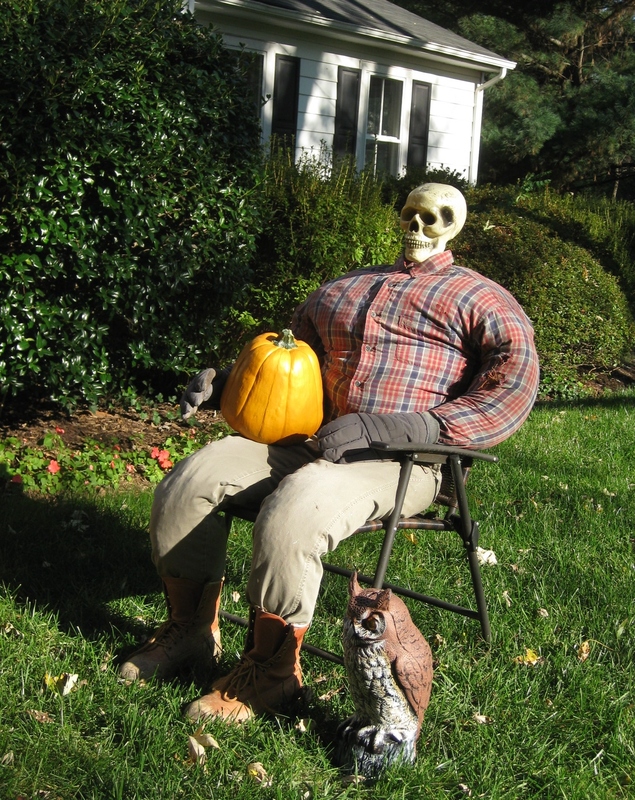 And finally, one last point for Halloween improvement: enough with the healthy snacks! On this topsy-turvy night, when the focus is on the weird, the unusual and the unexpected, let’s get with the spirit and allow our kids (the tall and the small) to indulge in the glory of real candy. And let’s stop trying to pass off raisins and pretzels as coveted treats; they have their merits, but they are for the other nights of the year. Halloween should be a much-anticipated departure from the norm. If we start eating healthier on the other days, we’ll really be able to enjoy breaking the rules on that last night of October. When my daughter was younger, she and I would make Halloween cards like this one I found the other day. Mother-daughter craft time is almost, but not entirely, a thing of the past. Now we start projects together, but she rarely has time to finish them. Arriving in Atlanta in the early afternoon, the airport is packed as usual. Is Hartsfield-Jackson ever not teeming with humanity? I wind my way through the slow-moving multitudes toward the train (formally, the Automated People Mover). I feel officially welcomed to my hometown when I hear the familiar electronic voice warning “Stop! Do not enter!,” followed by “Doors closing!” After exiting the train along with the herd and ascending the super-long escalator, I see my parents in their usual spot just outside baggage claim. That first glimpse is always a surprise—in my mind I guess I see them as thirty years younger. They probably do the same with me. After hugs and greetings, my father begins his customary discussion of the unfortunate parking situation. The parking garages are, indeed, in a constant state of reconstruction. There is great difficulty securing an empty spot, and even greater difficulty returning to that spot. My parents never fail to disagree about the optimum route. Once the car has been located, the next issue is threading our way out of the garage. My father continues to be a confident and competent driver, but in the airport parking lot he has a tendency to repeat urgently, “Which way? Which way?,” and to be oblivious to all exit signs. Mama’s suggestion that he calm down does nothing to ease the tension. I’m relieved, though, that Daddy is driving; I wouldn’t want to do it. In line at last to pay our parking fee, the car ahead of us never fails to be immovable. We watch with incredulity as the driver speaks at length to the attendant, as forms, cash and credit cards are exchanged, maps appear to be consulted and further conversation ensues. The number of documents passed back and forth befits a drive-through passport application office or a border crossing into a war zone. At long last, the car in front inches away, snail-like, but not before Daddy has tried (without success, due to the high volume of cars behind us), to move to another lane. Once at the parking booth, the ticket has usually disappeared under a seat. Finally out on the highway, Daddy’s limited patience has been severely tested, making the ride to my parents’ house all the more harrowing. In an attempt to make up for lost time, he drives at quite a clip, frequently changing lanes, all the while glancing back to ask me questions about the flight. Mama is a reluctant driver and an anxious passenger (she grew up with older brothers who wrecked cars and racked up severe injuries on a regular basis). Whenever possible, she sits in the back seat, with Daddy chauffeur-like in the front. She strongly urges my father to slow down, advice he clearly does not appreciate. Next time, I vow (as always), to take MARTA and spare my parents (and me) this hair-raising drive.